You can’t learn to be “Divine” from a book. You can’t learn to be Ted from a book. We are not characters – we are people made up of experiences. Our references may not always be from an educated source but from our daily observations and memories of those people and things we have surrounded ourselves with. 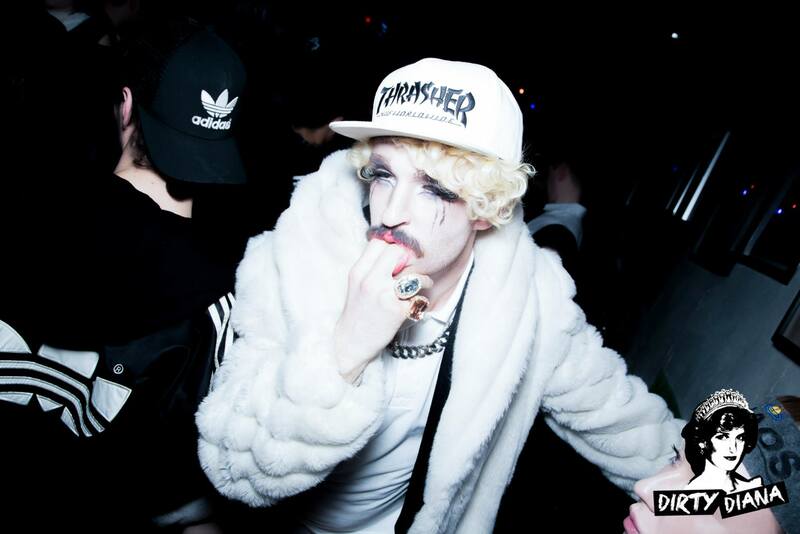 How I appear in a club is an attempt to find the true embodiment of who I am. And as an ever changing being my perceived “character” may also change. If you’ve ever reached a point in your life in which you decided you wish to die rather than continue to struggle with the reality of society and you surroundings – and you don’t die – then every decision you make from then on is either a choice to hold you closer to death or to live. Today I make the decision to try and live. To seek what is most loving for myself and others. And when I am in a club I am not performing a sterile act. I am living, I am allowing myself to reach a truer physical and mental state of who I really am in that moment. In the daytime I am somewhat tied down by society and it’s limits alongs with my fears; the risk of attack and abuse. I am a sensitive person and too much abuse takes it toll. Therefore I only allow myself partial freedoms and I test the waters of every new environment and situation. A dash of lipstick and a half look here and there is usually a safe-ish freedom in a cosmopolitan city. You can’t learn to be me. You can’t learn to be Ted because Ted is ever changing. You can attempt to post-analyse me and write a book about it but you will not gain much truth from this and you will be no closer to being that person. You can take reference from that person and explore yourself within this but ultimately you will find your own version that is made up of more than just that one reference. I choose to attempt to find myself in life. It’s hard, but if I choose to live as opposed to hide or die then it seems necessary to live as and attempt to find myself, not as how someone or something else dictates to me. That is not to say that a suggestion cannot be tried or experimented with if it is loving, but please spare me the questions on how I do what I do. I am not maths, I am a human. I do not have a formula, and my “character” is not based on fiction. I may have “Freddy” or “Benny” as references but this does not mean I am like them or trying to be like them and live out their lives. It would be pointless to attempt to learn how to be these people as they too are truthful beings of their own experience. Education can contribute, but if you spend too much time in a book or on a computer instead of experiencing something for real then all you are doing is filling yourself with hollow knowledge. There is no wisdom. You can only guess how these experiences may really feel until you have the opportunity to feel them. One may be tempted to join the game of society and be tainted by motivations such as money, fame or social acceptance. These all restrict us from finding our truth if they are to be our primary motivations. Many may be satisfied in life by the game, or numbed by chemicals or blissfully ignorant enough for this dissatisfaction not to affect them so much, they are comfortable enough to live this way. But I expect if you too have sought death then you will not be satisfied by the game of society. After all, why was death so attractive? We are freaks and mutants, the best and the worst and we experience the best and the worst the highest and the lowest. We are more soul sensitive, we can see the most but also blind ourselves the most. We often find comfort in abuse because we are more used to it than praise and positivity. But I ask you as a human to find your truth and in return I will continue to seek mine. Then maybe one day we will sit in comfort like the others and reminisce on what we have found.